Fresh flowers, flower bouquets and potted plants. 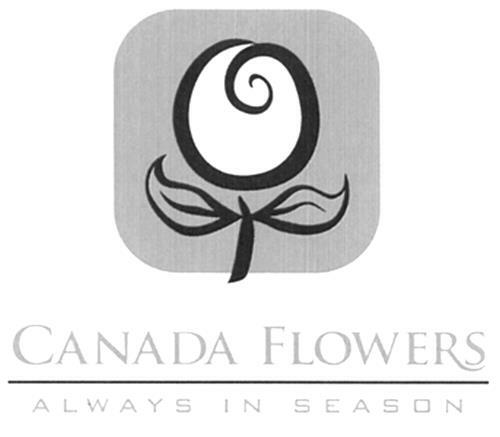 On Tuesday, November 18, 2008, a canadian trademark registration was filed for the above pictured logo by Ontario Flower Growers Co-Oper 910 Mid-Way Blvd., Mississauga, ONTARIO, CANADA L5T1T9. The Canadian IP office has given the trademark application number of 1419434. The current status of this trademark filing is Registration published. The correspondent listed for is LERNERS LLP of 88 DUFFERIN AVENUE, P.O.BOX 2335, LONDON, ONTARIO, CANADA N6A4G4 The trademark is filed in the description of Fresh flowers, flower bouquets and potted plants. .
(10) Other flowers, blossoms -- Notes: (a) Including flowers or blossoms of trees (cherry trees, peach trees, apple trees) and of bushes. -- (b) Including flowers of protea and strelitzia. (1) - Fresh flowers, flower bouquets and potted plants.